Please PM me if you decide to include this in your mod. Please include a link to this page if you include this in your mod. TES5Edit - for helping me clean up. Added a patch for littleorck's No requirement to buy Breezehome mod. 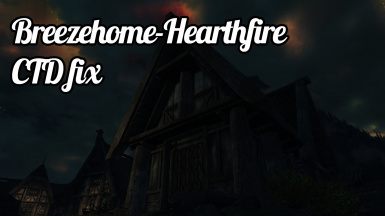 I've found a fix for CTDs when entering Breezehome with the Hearthfire expansion and mods installed. Hearthfire deletes the navmesh for Breezehome, and creates another one. If you have a mod that alters Breezehome in any way, it will cause a CTD because Navigation Door Link from the mod is set to the old navmesh. I found this out while cleaning up with TES5Edit. Place this file after everything that modifies Breezehome in your load order. This will screw up any mod that alters the original navmesh. This will just stop the CTDs. Mod authors should not rely on this to completely fix their mods, they need to alter the Hearthfire navmesh. If your mod is using the old navmesh, you need to switch to the new one in order to be compatible with Hearthfire. If you changed the navmesh, you need to edit Hearthfire's new navmesh. If you don't own Hearthfire, I would be happy to help you make a Herthfire version of your mod. I won't need credit for it. Please feel free to PM me if you need help. Place Breezehome-hf-CTD-fix.esp into your skyrim/data folder. Click "download with manager" and install with NMM.